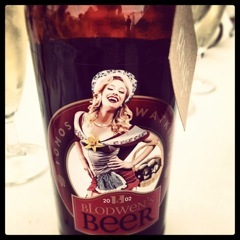 Tomos Watkin’s Blodwen’s Beer won the gold medal at last year’s Wales the True Taste awards. Head Brewer Alex Cunningham designed this beer for that segment of the market between lager and a beer although he says “it’s most definitely a beer”. It is brewed using lager malt for a light finish and very little hops are used. Alex describes it as a smooth light coloured ale’ and this is exactly what you would expect with lager malt providing a very light flavour and not much bitterness due to the sparing use of hops. It has grown to be one of Tomos Watkin’s biggest sellers. This entry was posted on 01/07/2013 at 23:25 and is filed under Drink of the month. You can follow any responses to this entry through the RSS 2.0 feed. You can leave a response, or trackback from your own site.